Midtown Veterinary Hospital first opened its doors in 1940, giving the community of Rochester a veterinary practice that has stood the test of time. Since the practice was recently purchased by Dr. Ami Maloco and her husband Ruel in May of 2018, we have made it our mission to create a practice that goes above and beyond in veterinary excellence. Much of our staff remains the same, ensuring that our continuing clients will recognize the same family-friendly atmosphere that we’ve maintained since the beginning, while our advancements in technology, services, and customer care bring us head and shoulders above the practice that you’ve already come to love. Dr. Paul Zimber will be staying with transitioning the practice for the remainder of 2018 before he retires. We have great respect for the legacy Dr. Zimber and his contribution to the community. We plan to continue that legacy and service to Rochester compiling resource, technology from our Dansville practice. 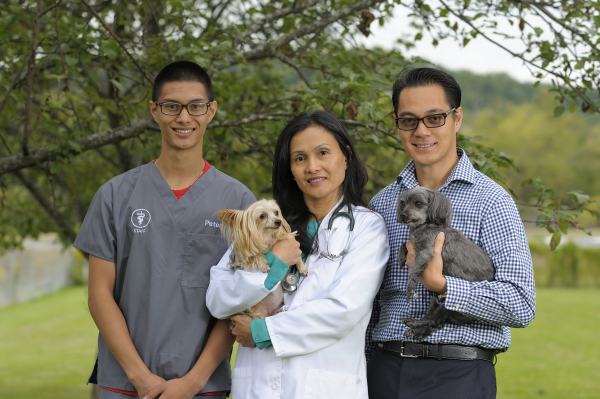 Dr. Ami Maloco and her team are committed to bringing exceptional veterinary care to the pets of Rochester, Dansville, and surrounding areas. We believe that it is so important to keep our clients educated and informed about their pet’s health care needs, and we are always seeking to expand by providing state-of-the-art services to our patients. We are also committed to personalized attention for each of our patients. At Midtown Veterinary Hospital, we see each and every patient as an individual. Health care needs, vaccinations, and treatment options are determined on an individual basis, ensuring that we have met the needs of the pet as well as the pet owner!